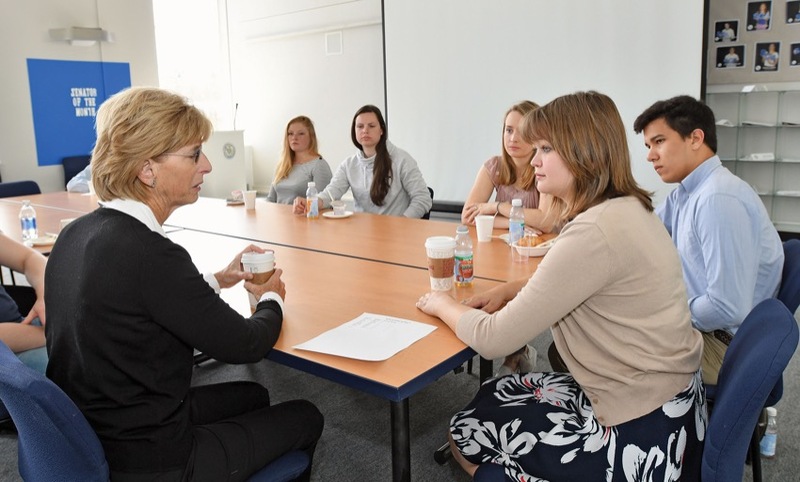 Speaking to a political science class this spring, former New Jersey governor and longtime Republican Christine Todd Whitman ’68 discussed the changing role of political parties, the need for collaboration and the 2016 presidential primary. Whitman, who also served as administrator of the Environmental Protection Agency (EPA) under President George W. Bush, now runs the Whitman Strategy Group, a team of environmental consultants. She was on campus to deliver a public lecture, “The Politics of Environment,” and also met with students in Assistant Professor of Political Science Bradford Bishop’s “Political Parties” and “American Political System” classes. As the child of two parents active in the Republican Party, Whitman was immersed in politics early on, attending the Republican National Convention from age 9. As a teenager, she reaffirmed her position as a Republican, separate from her parents’ views, appreciating the party’s focus on three key areas: fiscal discipline, a strong national defense and environmental protection. In those days, she said, both parties did not try to define their stance on every issue—allowing members to have differing views within the platform. Whitman said she still sees the value of political parties, which provide structure, but adds that they need to step back. She pointed to two contentious issues: abortion and climate change. The Republican Party view on both is strict, but within each issue, Whitman said, there should be room for compromise. Alyssa Gilman ’16, a psychology major, said she was impressed by how Whitman revealed a different kind of Republican Party than the one that is so often “vilified and derided” in the media. On the subject of the 2016 primary, Whitman expressed concern over how candidates had exploited the anger and frustration many Americans were feeling with the current economy. 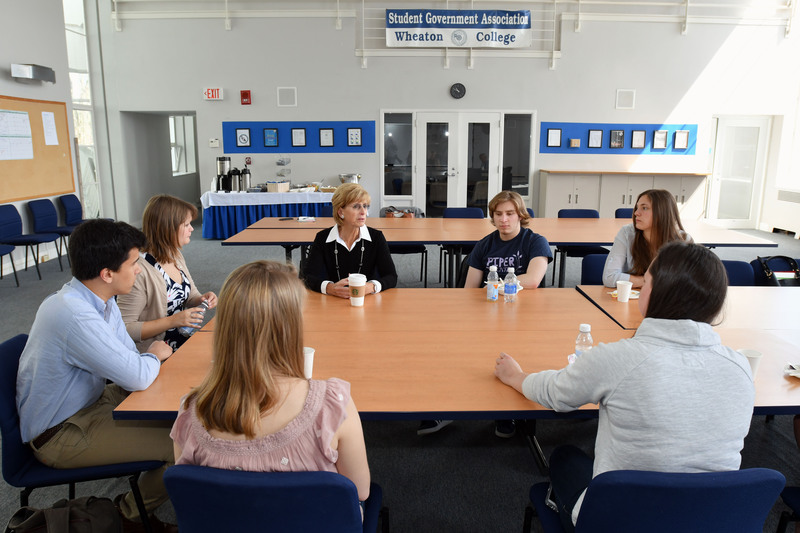 William Sweet ’17 found Whitman’s experience as head of the EPA especially interesting. “As a biology major who is passionate about environmental protection, it was encouraging to hear a politician talk about the role she has had in protecting our planet,” Sweet said. Whitman continued the conversation that evening in her public lecture, where Sarah Hilton ’16, outgoing president of the Student Government Association, introduced her as a “role model in using a Wheaton education to better the world around us.” During the talk, Whitman detailed why environmental protection is vital, the political challenges of environmental regulation and the path for making progress. While a vocal minority continue to question the reality of climate change, Whitman said, the majority of Americans agree that the planet is warming, that humans have played a role, and that we must change our behaviors to mitigate problems. The fact that some people disagree strongly with these views does not mean the country cannot make progress, she said. Whitman noted that the EPA was established in 1970 during the Nixon administration, amid a great deal of political and social turmoil, due to public demand for action by the government. “That should be a real reminder to us that things aren’t going to change unless we demand it,” she said.